Students with special and exceptional needs are placed in inclusive learning environments more frequently than in the past. For general educators with a limited special education background, this can often be anxiety provoking and stressful. Every teacher wants to provide the best instruction and education for her students. As a special education teacher for the past ten years, my job has been to support general education teachers when we share responsibility of students with special needs. I work with them to ensure that all students have the necessary resources in order to be successful, and that they themselves can grow and learn as an educator. Here are five strategies that have been successful for working with students in the inclusive classroom. 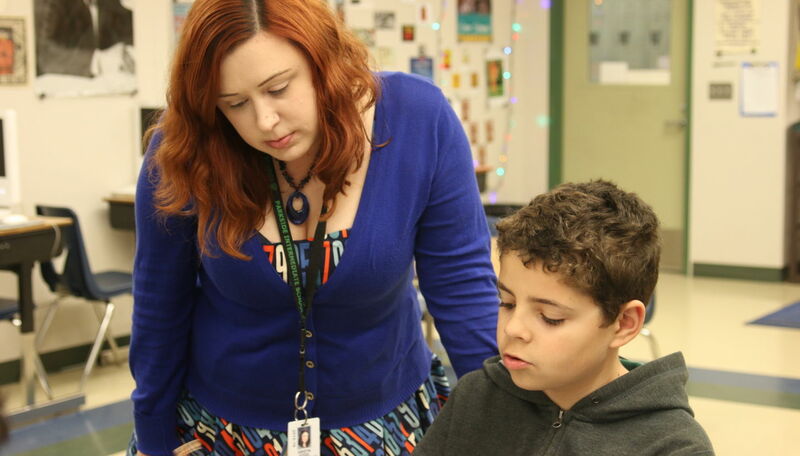 Upon receiving notice that a student with a specific plan is entering your class, it’s important to connect with that student’s case manager. For a student with a 504 plan, that is usually the school counselor; for a student with an IEP it’s either the Special Education Teacher or Resource Specialist. You should receive a brief synopsis of the IEP, often referred to as the “IEP at a Glance” form. This will detail the specific services and minutes each student receives, as well as any accommodations and modifications that are available for them. One of the most common accommodations for students with special needs is preferential seating. This doesn’t always mean in the front row of the classroom right next to the teacher’s desk. There are many instances where seating a student in the front row can be catastrophic! Most of the rooms I see are grouped in clusters; I like to make sure that a student I am working with is next to peers they feel comfortable with, and can help explain a concept during collaborative time. Seats away from distractions such as windows or doors is quite helpful for students with attention issues. Take Action: Check and make sure you have current documents for students in your class. Make a chart with what services each student receives and how frequently. Make note of their next IEP meeting date. If you haven’t started one yet, start a folder for student work samples-this will make the Special Educator’s job that much easier! Universal Design is so much more than one of the hottest buzzwords circulating around education circles. It’s an approach to curriculum planning and mapping that makes learning engaging and accessible to a wider range of learners with different strengths and needs. UDL builds on Howard Gardner’s theories of multiple intelligences, in that it calls for teaching to utilize multiple modalities, and for students to respond to learning with a variety of assessment tools. Educators that recognize the importance of UDL realize that we all learn and express ourselves in different ways, and that in order to assess skills we need to be allowed to use our strengths, while practicing our areas of need at the same time. A great introduction to the concepts behind UDL can be found at CAST’s website. Take Action: View the video and reflect on your teaching practices. How are you engaging students? How do students show what they know? How are students presented with material? Many of the teachers that I work with have a “Study Skills Thursday”, where students clean out their backpacks, organize their binders and notebooks, and focus on developing and self-reflecting on both short and long-term goals. I also do locker checks with some of my students. The battle is half won if a student comes to school organized and prepared. Take Action: Find or create a survey for your students to gauge what essential skills they have, and what they need (I use this Learning Skills and Work Habits Student Self-Assessment Checklist from Teachers Pay teachers). How can you incorporate instruction in these skills into your everyday schedule? No classroom is an island, especially an inclusive classroom. Opening up your room to service providers, paraprofessionals, special education teachers, and parents gives you valuable opportunities to participate in collaborative teaching. Collaborative teaching looks differently depending on what school, level, and setting you are working. I am fortunate enough to work in a school where collaborative teaching is encouraged and celebrated. Teachers have common planning times, and professional development time is often set aside for teachers to plan together. This often spans grade levels and subject areas. Take Action: Try to find a common time to sit and meet with your grade-level Special Education teacher. How can you work together to improve student learning? Draft a plan to hand to your administrator; perhaps you can receive a stipend for your planning time! Having a successful inclusive classroom depends upon having control of your classroom. It is essential to have clearly communicated expectations and goals, that are accessible to all students. Your classroom environment should be tailored to better suit diverse students’ needs. With students’ and specialists’ input, create a checklist or action plan for students. Using signals to quiet down, start working, and putting away materials. Giving students folders, labels and containers to organize supplies. Employing specific, targeted positive reinforcement when a student meets a behavioral or academic goal. Take Action: Look through student IEPs to see if any student has a formal Behavior Intervention Plan (BIP). Consult with your Special Education teacher for resources on how to establish and strengthen behavior management in your classroom. If possible, have the SpEd teacher observe and give feedback. There are many pieces to the puzzle for creating an effective inclusive classroom. Communication is key, and collaboration with other educators and professionals has a great benefit to all. Thanks for the affirmation of what I’ve been doing and the new helpful tips such as the checklist! Thank you for the inspiring and practical tips. You are a breath of fresh air! I look forward to future articles you write. We’ve been doing this in our district for years. Are her inclusive classes 50% SPED? I was so upset when I found out that some of my students had IEPs and I hadn’t known about it. I obviously accommodated them where I felt they needed it but having that key information would have helped me serve them better. Teaching ALL students needs to be the norm in every classrooms and I’m so glad Rider University drilled the methods for this task in our assignments and practicums. Including visual, audio and kinesthetics is a must because that’s the way HUMANS learn. I preach about Multiple Intelligences, especially to students who feel they’re not good at math which move them to think they are not intelligent. It really boosts their confidence once they see that their passion for poetry or auto-mechanics is considered their version of intelligence. This is your initial introduction to the institute of higher learning of your choice, so write a statement that commands the attention of the admissions officers. personal statement template for college.. These strategies are really great to help kids who have special needs. This is an excellent way to know your students and help them learn without getting stressed and anxious about it.